Tournament four meant it was the final week of Sapphire and it was Staffordshire’s turn to host. With two teams still in the running for the top spot and a fair amount of movement still possible in the rankings, it was all to play for on this final sunny Saturday! Like at Teeside, we had perfect weather for football! The sun was shining and there was barely a breeze, so we were expecting to see some serious balling from all teams. The Teeside Steelers were coming into this round stand out favourites to clinch the title, and all they had to do was win one of their games and had it. They were first up on pitch two against Cardiff who didn’t have anything to win or lose, but something to prove. Coach Simon Browning described this as Cardiff’s best defensive performance to date! The Valkyries were flying to the ball every play with their MVP nomination, Zoe John, causing havoc in the backfield. However, Teeside once again showed their athleticism and experience, with their MVP nominee, Siobhan Henry, causing problems for the Valkyries. Breaking tackles and pushing pass the defence for the scores! They weren’t just shining on offence though, on defence they were breaking down Cardiff’s offence and Charlotte Lewis seemed to want every interception, gaining one at LB, and nearly getting a second if Cardiff hadn’t noticed and knocked it down. Cardiff showed a lot of promise for next season, especially Beatle who was playing both ways and showed that she can fit into pass coverage just as well as she can be running back, grabbing an interception before the end of the game. It seemed that Teeside weren’t finished and were making sure they had this win, and the title fully in the bag going the whole length of the field with a pick 6! This wouldn’t be Sapphire without a couple of injuries and unfortunately the first in this tournament meant that the Valkyries lost their starting centre to a serious foot injury. The win, a seventh straight victory for the Steelers, locked them into the #1 spot in the conference, essentially crowning them champs with a game in hand! Over on pitch one, it was time for the Staffordshire Surge to face off against the Sandwell Steelers, who were still holding out hope for snatching the #2 spot in the Conference. After the score ended 20-6 to the Steelers last time these two met, the Surge wanted to show their improvement. Staffordshire were the fastest out of the blocks, it really was the perfect day for a passing game and the first score came through the air. QB Katie Friel-Russell took advantage when Sandwell’s coverage left Amber Norbury wide open for a simple ball over the top. However Sandwell answered right back running in a score, and it was looking like it might turn into a shoot out! However, Sandwell’s experience and stamina shone through in the second half with their D shutting out the Surge offence and scoring another four times on offence. Steelers’ #4, Nat Talbot, had a stand out game as the Surge defence simple couldn’t seem to catch her. Along with the Valkyries losing their starting centre, Surge lost captain and starting LB, Nikki Martin, and Sandwell lost their centre, Samantha Wilson, to and unfortunate knee injury. Special mention in this game goes to Surge who showed great sportsmanship. The ref had called 4th down when 4th down had just been played, so instead of taking a ‘freeby’ 5th down, they simply took a knee. The middle game of the day was Chester against Staffordshire. Chester were out for the win and Staffordshire were just hoping they didn’t get shut out entirely like the last time against the tough Romans side when the Surge offence couldn’t get going at all. These two teams hadn’t faced off since Tournament One where this was the first game for both teams in the entire series. At least on that occasion both teams came in fresh, whereas it was a battleworn Surge side, weary from a tough second half against the Steelers, that would face off against the tough Romans outfit, with an offence that has proven to be one of the most prolific in the entire women’s game. Aided by their fresh legs, Chester were showing they could run the ball, and the link up between their QB, Laura Hughes and receiver, Nat Kelly, through the air couldn’t seem to be stopped in the second half. Surge did have some promising moments. On defence, even though injuries were hitting them hard, they were stopping extra points and covering the long passes, showing a lot of improvement from Tournament One. Similarly, there were a few bright sparks for the Staffs offence – they couldn’t get past the half way line in their first outing against the Romans, whereas they moved the ball well this time round, even picking up a couple of scores… though time and again they proved they have no answer to the impressive balling of the Romans’ one woman wrecking crew, Megan Delaney. Megan was an absolute beast for the Romans, constantly shutting down the Surge offence and leading the defence as the epitome of captaincy. The final two games of the tournament were between Sandwell and Cardiff and then the big rivalry match between Teeside and Chester which was the game to watch. Sandwell came out with confidence after their win against the Surge, and won the first half against Cardiff. However, it was a fight to the finish for both teams. The only score Cardiff managed to gain from the first half was a pick 6 that the Sandwell QB threw unfortunately due to a knee injury. Alicia Marcella then had to take over at QB for the rest of the game as well as playing at safety. In the second half, Cardiff noticed that Sandwell’s weakness was the deep pass. After that Cardiff came back into the game and it was a fight of who could score the most. Sandwell were using #4 Nat Talbot to her full, and wouldn’t let up on the run game. She had a great first game against Surge and she wasn’t leaving anything behind against Cardiff proving why she was the nominated MVP from Sandwell. With each team answering the other’s TD, Sandwell’s first half performance was the winner for them giving them the edge in this game and taking the victory. Special shout outs go to #77 from Sandwell’s nose tackle, Laura Williams who not only had great game, but a great series. Also, Beatle from the Valkyries, repping on both sides of the ball for the whole of this round. The final game of the day was the one to watch. It was Teeside vs Chester. Last time they faced each other was way back in round one, a game that would be marred with some controversy as these two physical teams squared off, seeing coaches and players expressing their passion and frustration both on the gridiron and the sidelines. Even though the Steelers had already locked up the conference title, there was a lot of pride at stake and thus this was a fight to the end for both teams. It was the link up between Chester’s QB Laura Hughes and Nat Kelly, and Chester’s little pocket rocket running back, that stole the show though on offence. 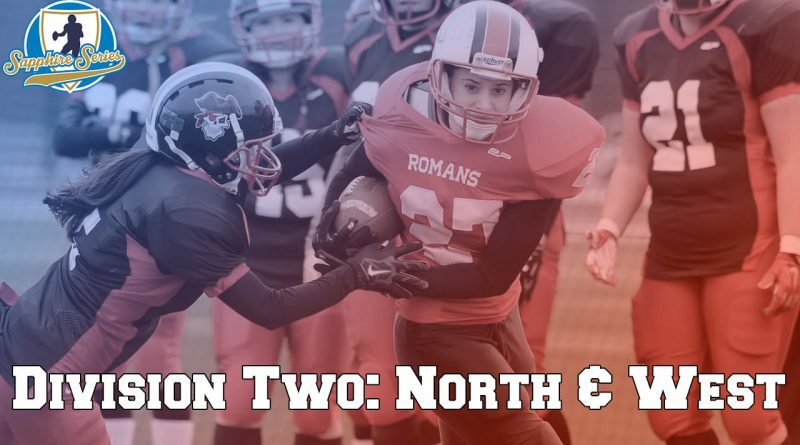 You can’t leave out the Romans defence though, standing strong for the whole of this round and making sure they did everything they could to stop Teeside’s dynamic offence. For the whole tournament, Nat Kelly has been a stand out receiver for the Roman’s, linking up with Hughes well and making important catches when needed. However, Teeside fought to the finish. Their QB for the whole tournament went in as WR and CB for this game and excelled at both, showing great footwork, making positive yards at receiver and displaying strong coverage skills at cornerback – picking up a score to boot! Chester took away the win from this one, but Teeside still came away as the champions. Of course, as is ever the case with the dynamic and progressive state of the women’s game in the UK, with rumours going around that these teams may need to jump to 7’s next year, and the constant improvement from all teams this series, everything could change next year! At the end of Sapphire, Teeside came out on top, with the Roman’s at 2nd, Sandwell 3rd, Cardiff at 4th and Surge at 5th. MVP was awarded to Surge’s RB, Tash Crump with the runner up being Teeside’s RB, Siobhan Henry.